SlugRoute works on desktop and laptop computers, as well as mobile devices. UC Santa Cruz students can see the location of campus shuttles in real time, helping them decide whether they should board a Metro bus or wait for the next loop or upper campus shuttle. 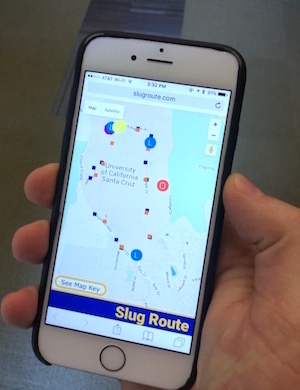 Transportation and Parking Services, in collaboration with undergraduate and graduate students, has launched SlugRoute, a desktop and mobile-friendly web app, that's powered by the Bus Tracking System, a hardware and software platform that tracks the movement of campus shuttles using a series of GPS transmitters and base stations across UC Santa Cruz. The project was driven by a group of entrepreneurial graduate and undergraduate students who saw a need on campus that could be solved with today's technology. "SlugRoute makes it easy to see if the next loop shuttle is minutes away," said Larry Pageler, director of Transportation and Parking Services. Besides providing a real-time tracking system for campus transit buses, the project team also fabricated new destination signs for the shuttle fleet. "This was a win/win project for TAPS and the students, as well as the campus community who rely on our shuttles to travel across campus," Pageler said. For TAPS, the benefits of SlugRoute are two-fold: the platform can help students decide whether they should wait for a campus shuttle or hop on a Metro, which will potentially preserve space on Metro buses for those needing to get off-campus. There may also be some cost savings, since the campus pays the same amount for every student who rides a Metro bus, regardless of whether they go from Kresge to Cowell or Science Hill to downtown. The Bus Tracking System, which is the underlying technology behind the web app, was started by students of computer engineering Professor Katia Obrackza, who initially pitched it as a project for undergraduates looking for a senior design project. "They have to do senior capstone projects, so I pitched this idea to them," said Obrackza. "They took it over, designed the system, and had a prototype." The prototype (which relied on the cellular network) was not the most effective design. Graduate student Kerry Veenstra took on the project, redesigning as part of his thesis. Transmitters installed on the campus shuttles send GPS coordinates to be shown on SlugRoute. The effort to create this tool for the campus posed several engineering challenges for the students. Another group of students on the project, working with electrical engineering Professor Stephen Petersen, had to figure out the best location for an array of base stations to receive the GPS signals. Also, campus buses can be used for either the loop route or the upper campus route, so students installed small black boxes that have a switch that can let the Bus Tracking System know which route they're servicing. The web app piece—SlugRoute—was designed by Wade "Simba" Khadder, an undergraduate in computer science who took a prototype to a UCSC Hackathon before meeting with Pageler. Pageler later connected Khadder with the rest of the BTS group, so that they could merge their work.